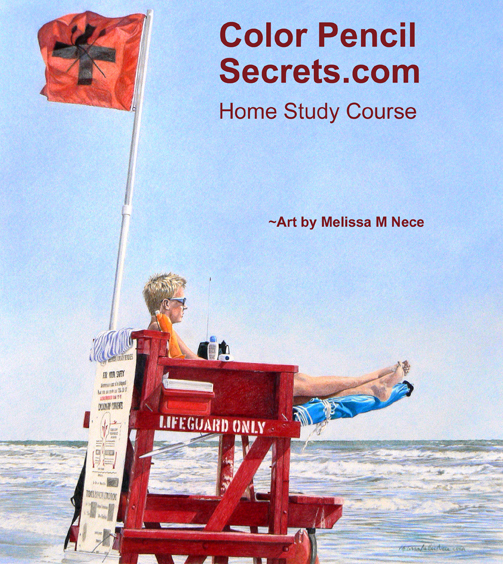 I have been selected as one of TEN Colored Pencil Masters to be featured in a brand new Home Study Course called Sessions with Colored Pencil Masters. My work will also be featured on Nov. 13, 1 p.m. EST, in an international webinar which gives a sneak peek of the course with tips, tricks and shortcuts from top Masters. To sign up for the webinar click here. Even if you can’t watch it live, sign up so you will get a link to the replay. One of my artworks used in this course. If you want to buy a copy of this new course at a special low price, contact me for a special discount offer. If 10 people or more contact me to buy a copy of the course, I can order it in bulk for resale at a larger discount. My mixed media technique is featured in the “Drawing Board” column of the October 2012 issue of The Artist’s Magazine. It is a step-by-step demonstration of the technique I developed using colored pencil over alkyd oil paint over clear gesso. This is the same technique we explore in my newest workshop, “Mixing Media with Colored Pencil and Pastel.” (See previous posts for scheduled workshop dates.) 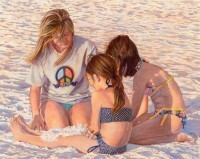 The models for both drawings in the article are my beautiful nieces. A summary of the article and an example of a variation of the technique can be found online at ArtistsNetwork. Join this award winning, nationally recognized artist for one on one instruction in drawing, colored pencil, acrylic, oil or mixed media. Open to any beginning or advanced artist that strives for realism in their work. Take it to the next level as you strengthen your drawing skills, develop techniques, design better compositions and simplify color mixing in the medium(s) of your choice. Bring your own materials; additional products will be available to try in class. Basic Drawing (401) Learn to see as an artist sees – so you can draw anything! Watersoluble colored pencils combine the precision and control of pencil drawing with the fluid possibilities of watercolor paint. Come explore the many ways these versatile drawing tools can be used—wet or dry, alone or for mixed media. Derwent, the leading makers and innovators in this fine art medium, will supply some of their newest products for use in this class. 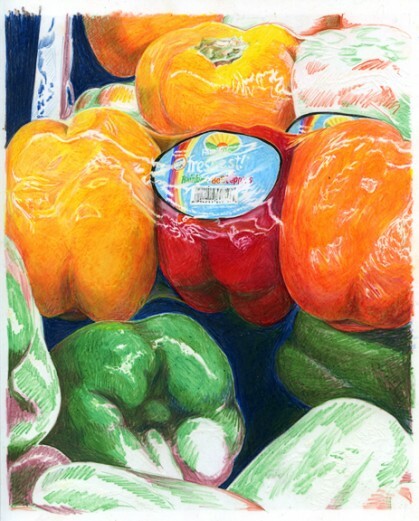 An easy introduction to the possibilities of colored pencil, this class covers fun and fast techniques for any kind of subject or style. It includes technical exercises using provided tools and papers, followed by guided completion of a class project, and student selected projects. Instruction includes tips of color mixing, finishing, and presentation. “Summer Sunset 2″ was selected for First Place in the Pastel, Pen & Pencil category at the 27th Annual North American Miniature Art Exhibition at the Art Gallery of Fells Point in Baltimore. This is a 2 x 4” colored pencil piece showing a sunset over the Gulf of Mexico from the county park observation tower near my home. The show runs to October 30, 2010. I recently undertook a special project to help out Grafix, the makers of Dura-Lar and other drawing films, who wanted art for an instructional video. (I will post the link when it’s online.) The artwork was left unfinished so that in the video, the use of both sides of the drawing film is more evident. When it’s returned, I’ll finish it up completely, but it’s pretty cool as it stands now. 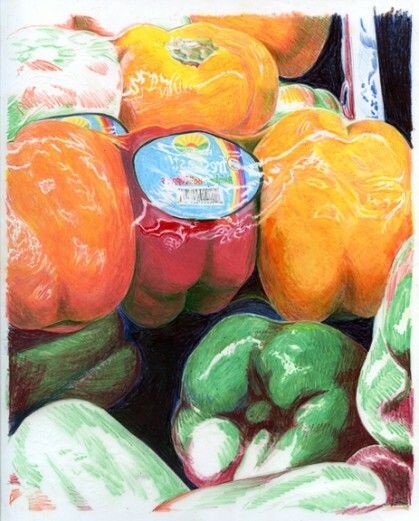 The peppers are done on Dura-Lar from my own photo with Prismacolor pencils. Prismacolor Verithin pencils were also used for sketching outlines and some coloring. Initial colors were worked on a heated work surface so they would soften and blend easily. As the work progressed, I worked mainly on a regular table, but I did take the piece back to the heated surface a few more times when I felt softening the color would give smoother blending and better coverage. The film was flipped over frequently so additional colors could be applied to the back. In most cases, complementary colors were applied to the back so they would make richer shadows for the darker local color applied to the front. This is still evident in the unfinished green peppers across the bottom. Tuscan Red, which is the darkest red, was applied behind the shadow areas of the green peppers, which I have started to fill in on the front with Dark Green and Grass Green. Note also some greens behind the unfinished yellow, orange and red peppers at the top, and Tuscan Red behind the vertical shelf support at the top left. Also applied on the back is Dark Umber, which was used to darken the deep space between the green peppers. This space is mostly Indigo Blue on the front, with Dark Green and some reds and the Umber added. I left the strokes obvious in the unfinished areas. This is how the color was initially applied in most parts of the drawing. But as you can see, the strokes do not show in the finished parts, where colors were blended in three ways. A soft eraser in pencil form was used to smooth out strokes, both over heat and on the table. A colorless blender pencil also was used, and this worked especially well on the heated surface. Colors were also blended simply by using extra pressure with the dominant color on top. In some places, colors were worked with pressure from the harder Verithin pencils. I used the “pencil” eraser mentioned above and a kneaded eraser to make corrections and to bring back “white” (transparency so the backing board can show through) although most highlights are done with white colored pencil. In a few places, thin white lines were done by scratching carefully with the tip of an X-Acto knife. I will finish this piece by adding more color on both sides and blending it out as described. The green peppers will look as smooth and realistic as the ones across the middle. Going back to the heated work surface will probably be important for unifying the finished effect. New Work Wins Best of Show! My newest piece was selected as Best of Show winner in the annual Members Show of the Professional Association of Visual Artists. The show at the Clearwater (FL) Main Library runs through November 29. Normally, I work with multiple brands of colored pencils in a large range of colors, but for this piece, I chose to limit myself to a basic 24-color set of the most commonly recognized brand. The paper is white Stonehenge, a terrific 100% cotton heavyweight paper that seems to love colored pencil. I generally use colored papers like Stonehenge’s cream and light gray, but the white was well-suited for the reflective highlights of the plastic containers and their labels, and it maintained the purity of the crayon-like colors of the frosting. Limiting my palette (I did not even use all 24 colors in the set), I was able to maintain color harmony in the piece, but using complimentary colors allowed me to develop a lively and broad range of colors and values. Using one slightly harder pencil from a related product line, I was even able to make most of the ingredient lists readable – try that with any other medium! It was especially gratifying that this modestly-sized piece (9 x 8″) was selected as Best of Show in PAVA’s annual Members Show where it competed with work that was much larger and in all media. 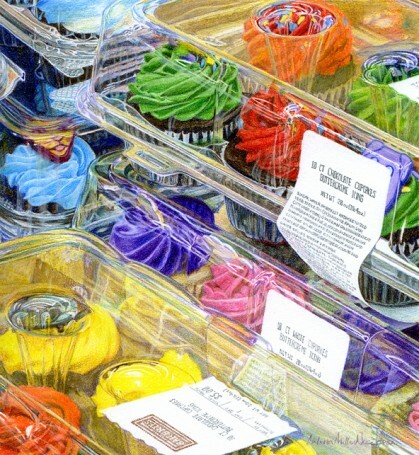 I believe it was the ability of colored pencil to mimic the slickness of the plastic and the lusciousness of the frosting that won over the two judges. 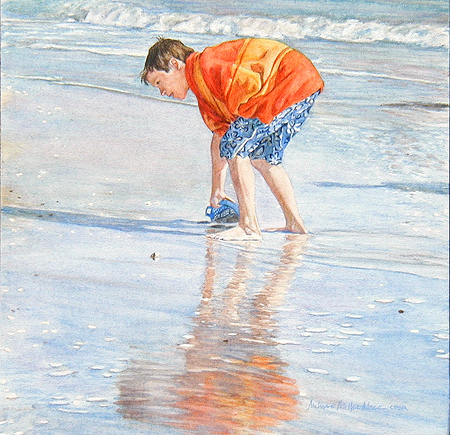 1-Day Colored Pencil Plein Air workshop, $75 members/$105 non-members – Colored pencil is a great medium for travel journaling or studies on location. 2-Day “Better Painting by Design” workshop, $140 members/$170 non-members – Learn the principles of design to take your artwork from ordinary to extraordinary. 2-Day Discover Watercolor Pencil Workshop, $140 members/$170 non-members – All pencils and paper provided! A fast-paced and fun introduction to this very versatile medium which combines the precision of drawing with the expressiveness of paint. Ongoing Colored Pencil class, Monday mornings. Call for details. All pencils and paper provided! A fast-paced and fun introduction to this very versatile medium which combines the precision of drawing with the expressiveness of paint. Introduction to Colored Pencils (1½ hour evening class), Oct. 20, FREE, limited seating, RSVP required. All materials provided. 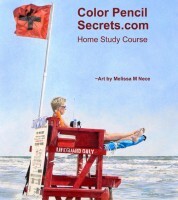 Learn “The Secret Weapons of Colored Pencil” — Whether you are new to colored pencil or more experienced, you will learn techniques that make it fast and easy to get the right effect. You too can produce work that makes others say, “I can’t believe that’s colored pencil.” Every workshop participant will receive a custom kit with handouts, special tools, paper samples and/or other useful products. The Florida Museum for Women Artists opens to the public in Deland on November 14, and my piece Beach Walk is among the 40+ artworks selected for the Inaugural Exhibition. There is a Patron’s Preview and Members’ Reception on Friday evening, November 13. The public opening begins with Ribbon Cutting Ceremonies by DeLand Mayor Apgar at 11AM on Saturday, November 14. Admission that day will be free for everyone. The Florida Museum of Women Artists is located at 100 N. Woodland Blvd in DeLand. Regular hours are Tue-Thurs, 11AM-6PM; Fri-Sat, 11AM-7PM; Sun, 1PM-5PM (closed Mondays and major holidays). The 7,300 square foot space includes three galleries, a gift shop, Cafe, meeting / lecture space, and curatorial area. Future exhibitions will include contemporary art, collections and traveling exhibits from other institutions. Click here to read related article from the Orlando Sentinel. We’re excited to introduce a new four week colored pencil class at the Beach Art Center in Indian Rocks Beach, FL. This shorter session is especially intended for people unable to commit to a six-week class or who cannot make a longer drive to Dunedin. We will cover the same material, introducing techniques to beginners and helping more experienced students to develop their ideas and personal styles. Melissa Miller Nece is regarded as one of the foremost colored pencil artists in the US. Her enthusiasm and humor have made her a favorite speaker for arts groups, and she has inspired many others to try colored pencils through her classes and workshops. Her work has been published in national magazines and numerous books on colored pencil and portraiture.